This post was sponsored by sponsored by the Role Mommy Writer's Network. I received compensation for this post. The opinions within this post are of my own and I was not influenced in any way. Please do your own research before purchasing products or using services. Your opinions and results may differ. This post contains an embedded video. Photo credits courtesy of CBS Television Network. I was given the opportunity to watch an advanced preview of The Dovekeepers, and was impressed with what executive producers Mark Burnett and Roma Downey compiled. I was previously an admirer of Mark and Roma's work with Son of God and The Bible, and they didn't let down this time either. The Dovekeepers is a compelling story of three women who have strong secrets. Aziza is a warrior and expert archer, Yael is an outcast, and Shirah is accused of witchcraft. Their stories are woven around Mesada, a mountain fortress created by a king. The story is beautifully written and the visual effects are stunning. Some scenes in the series are harsh and in-your-face, and a couple of the love scenes are steamy (but not raunchy). The three women's stories of survival will draw you in and the overall cast performances are unforgettable. The settings felt like I was taken back in time. Although I've already previewed this series, I'll definitely be watching it again on CBS March 31st and April 1st. I highly recommend that you tune in and watch as well. 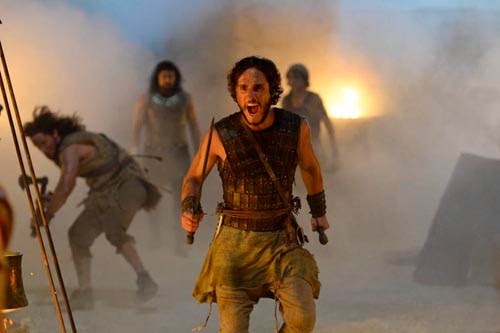 Will you be viewing The Dovekeepers when it airs on CBS? I wasn't aware of this upcoming series. Thanks for sharing!